UK Ministry of Defence bosses have announced their intention to retire seven ships and reduce the Royal Marines by 1000 personnel in a cost-saving effort necessitated by the acquisition of two world-class aircraft carriers, the HMS Queen Elizabeth and the HMS Prince of Wales. It’s brilliant that the Royal Navy is stepping boldly into the 21st-century with two state-of-the-art aircraft carriers, yet many sailors will miss the still great but aging ships, which have a decade or two of service life left in them. In fact, two of the soon-to-be retired vessels, the HMS Albion and the HMS Bulwark aren’t even halfway through their expected life-cycle but are excellent ships that could be sold to any Commonwealth nation. As an island nation and as the world’s oldest sea power, Britain should always command a first-rate navy, and good policy would dictate the sale of RN ships halfway through their normal life-cycle to help defer the costs of maintaining that world-class navy. The helicopter carrier HMS Ocean was also marked out for retirement in an earlier press release along with four smaller Royal Navy ships, but they too could serve out the rest of their expected life in any Commonwealth nation. Commonwealth Partner Canada – Needs Those Ships! The Royal Canadian Navy depends heavily on its 12 naval frigate fleet and is desperately lacking in rescue capability (helicopter carrier) and littoral combat (close-to-shore) vessels — which gaps could be filled by the soon-to-be-retired HMS Ocean, HMS Albion, and HMS Bulwark, while saving the Canadian navy billions of dollars — and more importantly, the several years required for Canada to build new ships. Although Canada has a great navy with proud tradition there are major credibility gaps in Canada’s fleet and purchasing these Royal Navy ships could partially alleviate that gap, thereby propelling the RCN forward by at least five years and at very reasonable cost compared to building new ships. Canada should constantly drop hints to the Royal Navy to allow them be first to bid on ships and helicopters set for early retirement. Commonwealth Partner India – Needs Those Ships! The Indian Navy has a vast area to patrol in one of the busiest shipping regions of the world and it can’t get enough ships. Ever! Modern naval vessels are very expensive to build, but expensive new ships don’t always suit the needs of the Indian Navy — a navy that requires huge numbers of vessels to patrol all those millions of square miles. Not all of them need to be world-class combat ships. With thousands of cargo ships and cruise ships travelling through the region every day, and with piracy at an all-time high in the Indian Ocean having enough ships available to maintain a presence is far more important than how shiny the paint is on inspection day. The level of shipping activity in the Indian Ocean region can only be described as frenetic and piracy is a common problem in the adjacent Arabian Sea and off the east coast of Africa where many Indian registered ships carry trillions of dollars of raw materials and manufactured goods every year. Australia fields a modern navy and (thankfully) it enjoys the strong support of the Australian government. The country purchases build-to-suit ships and submarines from various countries and it occasionally sells its used ships to New Zealand — a good arrangement for both countries. However, some early retirement Royal Navy ships could be valuable to the Royal Australian Navy in the future. Their navy is heavy with helicopter frigates and minesweepers and has a respectable number of submarines — yet there may be occasion when Britain’s navy could decide to part with ships that meet the needs of the Australian fleet. The only thing lacking in the RAN fleet are destroyers. They could make-do with 6 as we are presently in peacetime; At the moment, the Royal Australian Navy has 1 destroyer. Many Commonwealth nations are maritime countries with various naval capabilities, yet purchasing new ships is an expensive proposition for rapidly developing nations. For them, it’s difficult to justify a billion dollar warship when they need crucial infrastructure (yesterday!) to serve the needs of their citizens. Yet, having an effective naval presence to deter piracy and to protect national sovereignty becomes increasingly important as their GDP rises. One way for them to accomplish two goals at once is to purchase used RN vessels that match their needs. Indeed, for the cost of one new frigate a small nation may be able to purchase five used, but still effective, former Royal Navy frigates or smaller coastal defence craft to provide security in nearby shipping lanes. Until now it has been normal for navies to max-out the life of their ships and to pay massive sums to refit their navy ships at mid-point in their life-cycle (some refits cost more than the original ship!) and that’s an expensive way to outfit a navy when there is a better alternative. In the 21st-century there are so many rapidly developing Commonwealth nations, UK shipyards could have a continuous frigate assembly line, a continuous destroyer assembly line and a continuous coastal patrol craft assembly line to keep up with total demand from a world-class Royal Navy that retires its ships early and sells them to allied nations. But that’s only if the Royal Navy makes the historic decision to sell its ships at the 12-year mark, while they still have at least 18-years of life left in them. 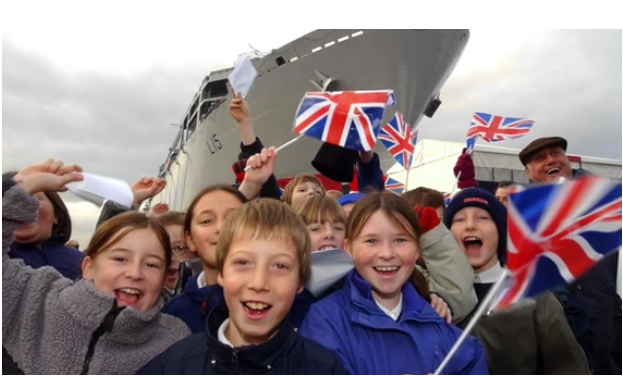 It would be wise to continue to operate them as usual — but simply make it known to Commonwealth partners that any Royal Navy vessel over 6-years of age is automatically available for purchase to Commonwealth members. As the Commonwealth’s rapidly developing nations continue to increase their wealth, they’ll have evermore reason to protect what’s theirs and to surveil and protect foreign ships travelling through their waters. Instead of keeping ships for decades and running them into the ground along with one or two costly refits over the years, in the 21st-century the better way is to sell them to Commonwealth nations at the 6-12 year mark while the vessels still have plenty of useful service life remaining. And in that way, create a healthy UK shipbuilding industry geared towards Royal Navy needs, but also to the needs of Britain’s allies. That’s how you build a better Royal Navy and help your Commonwealth partners at the same time!